This Newsletter has often examined the situation of the US in relation to its burden of debt. The increase in the debt is ongoing. 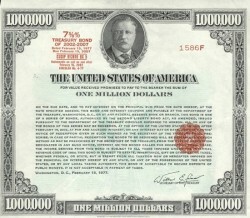 The US Debt Clock (www.usdebtclock.org) currently registers $ 21.509 trillion for the US national debt and rising. This figure taken by itself is already enormous and is larger than GDP (Gross Domestic Product), which at present stands at $20.445 trillion. This means that the ratio of debt to GDP is 104.69%. The EU some time ago established that no member country should have a debt to GDP ratio higher than 60%. The fact is that not all EU countries have such a ratio less than 60%, only fourteen do. The others are all over 60% with Greece at 180%, Italy 131%, Portugal 126%, Belgium 106%, Spain 99%, France 98%, Cyprus 95%, United Kingdom 86%, and on it goes. So the US is not in good company when it is a question of the debt ratio to GDP. The problem is not only the size of the debt, but there is the burden of servicing the debt. In the event that an auction of Treasury debt instruments fails to be fully subscribed, the Fed can always buy up the remaining debt though that is not really a satisfactory solution. Rolling over the national debt can therefore be achieved even in a worst case scenario. The problem of servicing the debt is an entirely different problem. This fact has not escaped the notice of market observers. With a low-interest environment, it was not expensive for the government to increase debt at a rapid pace. The Obama administration doubled the national debt in only eight years, not a very impressive feat but certainly one that should cause concern. The current Republican administration seems destined to increase the debt still further with a one trillion dollar deficit foreseen for 2019. The problem will become acute with rising interest rates. Servicing the debt is projected to cost $ 390 billion in 2019 and in five years more than $ 900 billion. That will be more than the budget for the Department of Defense. This might lead to a financial meltdown in that the Treasury will be forced to have the Fed buy up debt in order to make payments on the national debt, and this could result in runaway inflation. If demand for the US dollar decreases globally due to the implementation of payment systems that offer an alternative to the US dollar and the petrodollar system is substantially weakened, then investors will be rushing to the exits that lead to nowhere but Doom and Gloom.